A couple of weeks ago I had the opportunity to visit a Urban Upgrading program in Honduras in which Crime and Violence (C&V) prevention was an active component of the project from the beginning. I was impressed by both the methodology used to achieve this as well as some of the initial anecdotic evidence of the results (A robust Impact Evaluation is on the way). From my previous experience, urban interventions in informal settlements in countries in Latin America are many times leaded by politicians who seek a less violent city – an off course citizens who identify security as one of their main concerns. In Medellin, we can argue that it was violence that started to increase the awareness of a “problem” that was related to (or concentrated in) informal settlements and the urgency to act in those areas. We have seen the same in places like Rio de Janeiro and Sao Paulo with the upcoming World Cup and Olympic games. However, in my opinion, in most of the urban interventions in which there is a reduction of violence it has been an indirect product of urban upgrading or C&V repression rather than through a real consideration of the C&V prevention tool. I guess it is part of human nature to concentrate on what is consider a problem (C&V, Natural Disasters, unplanned housing development) and try to solve it from there (C&V Repression, emergency response and slum upgrading) instead of focusing on its origins (C&V and disaster prevention, housing policies and harmonic urban planning). Unfortunately in recent years Honduras has followed the increasing violence trend of Central America and is today one of the most violent countries in the world. Today, official rates indicate that there were 86 homicides per 100.000 inhabitants in 2011 (above 10 homicides per 100.000 inhabitants it is considered an epidemic). The spread of Violence in Central America and other cities in Latin America is linked – in my opinion – to three common issues, namely Poverty, Youth and Exclusion; and one very tempting opportunity of achieving higher levels of social status: belonging to criminal organizations that are usually linked to drug dealing. One mayor of a small municipality in Honduras said: “it is very difficult to solve Poverty at the short term, impossible to “solve” Youth but we might manage to reduce Exclusion”. The Honduras urban upgrading + Crime and violence prevention project is called Barrio Ciudad (I have to admit that I am in love with the name). The main objective of the project is to improve the quality of life of the urban poor through the (i) improvement of their access to basic services, (ii) the strengthening of human and social capital in selected neighborhoods using participatory planning techniques and (iii) the improvement of the capacities to prevent crime and violence of the central, municipal government and communities. 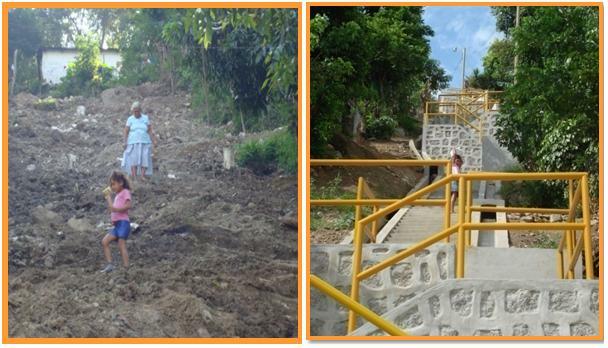 The pictures presented above correspond to physical interventions in two of the selected neighborhoods in the Villanueva municipality and El Progreso municipality. The neighborhoods selected resulted from crossing violence and socio-economic maps. This project is financed by the World Bank and implemented by FHIS (Fondo Hondureño de Inversión Social). A similar project is being implemented in Jamaica. So what is Barrio Ciudad doing differently? In reality, many of the things that Barrio Ciudad is doing have been done before and might seem familiar to those working on urban upgrading issues. For instance, the project has a high component of community participation from the diagnostic to implementation. It also, uses concepts that have been widely used for infrastructure design in poor areas by adapting Crime Prevention Through Environmental Design (CPTED) methodologies. In my opinion, what makes this project unique is that it has given Crime and Violence Prevention a central role and many of the activities included in the project reflect this. For instance, C&V prevention in school workshops have been conducted with teachers and community leaders (see the manual links below). Giving C&V prevention a central role has allowed the project to expand its impact beyond its borders and today a number of Mayor’s of the selected municipalities and nearby municipalities have started to use C&V methodologies to upgrade other urban areas. At the same time, it has been essential to start turning some heads towards the prevention agenda. What do you think? Do you know of any other interventions that have C&V prevention in the core of their design?